Peterborough Sports' Josh McCammon shoots at goal against Leek Town. Photo: James Richardson. There’s another tough game in store for Peterborough Sports as they continue their battle against relegation in Division One South of the EVO Stik League tomorrow (December 9). Sports, who have lost seven of their last eight matches following a 2-1 home defeat at home to Leek Town last weekend (December 2), host sixth-placed Frickley Athletic (3pm kick off). Josh Moreman (ripped shirt) in action for Peterborough Sports against Leek Town. Photo: James Richardson. Sports are six points clear of the one relegation spot. 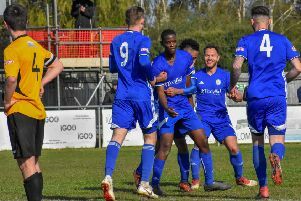 Stamford AFC have eyes on the play-offs and they will fancy their chances at Chasetown tomorrow, when Spalding seek to avoid a seventh straight loss at Loughborough Dynamo. Big game in the United Counties Premier Division tomorrow sees Deeping Rangers travel to leaders Newport Pagnell, while Peterborough Northern Star will attempt a first win under new boss Steve Wilson at home to Kirby Muxloe. Division One leaders Pinchbeck protect their six-point advantage at home to Huntingdon Town tomorrow. Division One South: Chasetown v Stamford, Loughborough Dynamo v Spalding Utd, Peterborough Sports v Frickley Athletic. Premier Division: Holbeach United v Rothwell Corinthians, Newport Pagnell Town v Deeping Rangers, Peterborough Northern Star v Kirby Muxloe, Wisbech Town v Eynesbury Rovers, Yaxley v Wellingborough Whitworth. Division One: Blackstones v Burton Park Wanderers, Bourne Town v Irchester United, Pinchbeck United v Huntingdon Town. Division One: Needham Market Res v March Town United, Wisbech St Mary v Framlingham Town.